They claimed their first-ever victory in a competitive international against Armenia on Saturday. 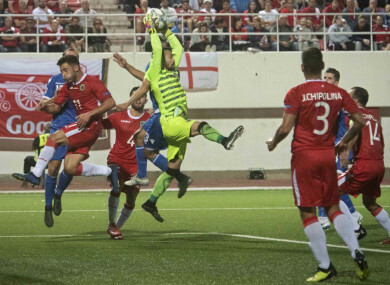 LITTLE GIBRALTAR ROUNDED off a memorable few days by beating Liechtenstein 2-1 on Tuesday to grab their second consecutive competitive win after a previous run of 22 defeats. Having claimed their first-ever victory in a competitive international with a 1-0 success in Armenia on Saturday, the Gibraltans came from behind to edge out Liechtenstein. Second-half strikes from George Cabrera and Joseph Chipolina cancelled out Dennis Salanovic’s early opener for the visitors on the Iberian Peninsula. Since Gibraltar joined UEFA in 2013, they have suffered a series of heavy defeats, losing to Poland 8-1 and 7-0 and 7-0 against Germany and the Republic of Ireland in Euro 2016 qualifying. Their worst defeat was a 9-0 hammering at the hands of Belgium in World Cup qualifying in 2017. But now they will be dreaming of qualifying for Euro 2020 through the Nations League — they sit just three points behind leaders Macedonia in Group 4 of League D.
Elsewhere, Georgia secured promotion to League C, and a place in the play-offs for the European Championship, with a 3-0 victory in Latvia. Ukraine also booked at least a play-off spot as Ruslan Malinovsky scored the only goal in a 1-0 win over the Czech Republic which wrapped up promotion to League A.
Email “Gibraltar put 22-game losing streak behind them with second straight win in three days”. Feedback on “Gibraltar put 22-game losing streak behind them with second straight win in three days”.